Released just this month by Swedish Match, General Strong White Mini is a new mini portion snus designed to deliver a good buzz in a small format. With 6mg of nicotine per 5 gram portion, Strong White Mini is classified as a strong mini portion snus (standard size snus has 8mg) and there is 20 portions per can. When I opened my can of Strong White Mini, I noticed a an aroma of tobacco, with a slight hint of citrus as well. Once I placed a portion in my mouth, the taste took a few minutes to develop, and it reminded me a lot of the Classic General taste of bergamot (a sour citrus fruit) and tobacco. Initially, I detected a slight taste of bergamot, but tobacco was the dominant flavor. After about twenty minutes the bergamot flavor subsided and it gave way to a salty tobacco flavor. As a fan of tobacco flavored snus brands (one of my favorite snuses is General Onyx) I found the flavor transition to be very pleasant. I also found that the flavor pairs quite well with a good pilsner beer such as Warschteiner. The portions were very comfortable, and were quite dry. Because of the dryness, I found that it took a little longer than other snuses before I began to feel a pleasant nicotine buzz. However, because of the dryness of the snus, I was able to keep a portion in for about an hour without experiencing any drip. The mini portion format great to use at bars, as their small size allowed me to easily conceal them. While some of my other friends were off outside in the cold smoking, I was able to stay in the bar and enjoy a nice nicotine buzz while sipping my beer. 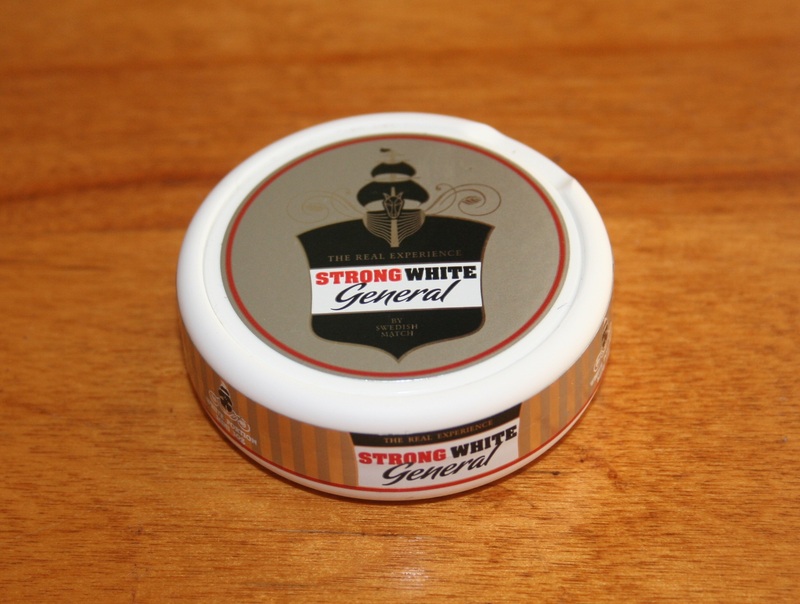 General Strong White Mini is a mini portion snus which has been designed to pack a punch for its size. 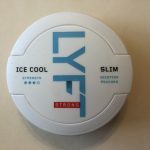 With a delicious Classic General taste of bergamot and tobacco, it is great for those who enjoy tobacco flavored snus blends, and the dryness allows the snus to last longer without producing drip. 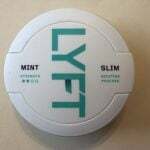 The small portion format is also great for times when you must conceal your snus use, but still want a good nicotine buzz (school, work, bars, etc). I think Swedish Match did a pretty great job with this snus, and I can see Strong White Mini being added to my daily rotation of snus. 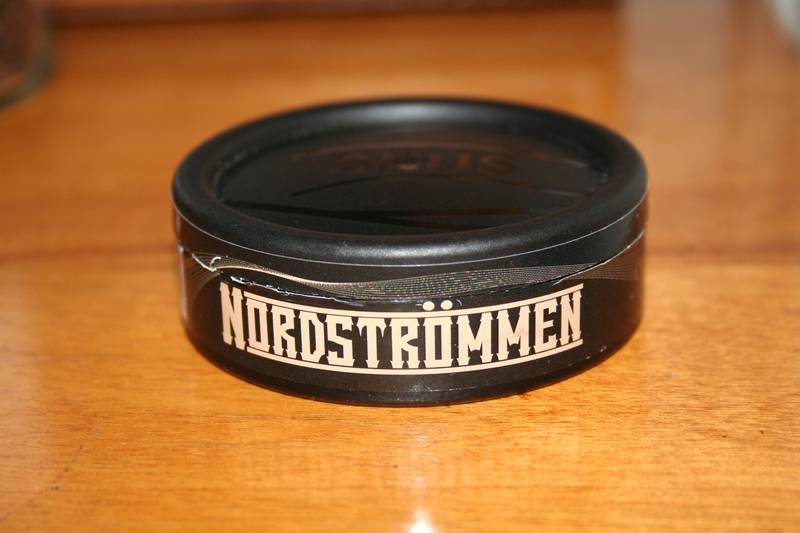 Today, I decided to write a review of a snus which has recently come back into production after taking a bit of a hiatus. Manufactured by V2 Tobacco, Nordströmmen Brandy Alexander Loose is a finely ground loose snus with a brandy flavor profile. Per gram of snus, Brandy Alexander contains 8mg of nicotine, classifying it as a regular strength brand of snus. When I first opened my can of Brandy Alexander, I instantly fell in love with the aroma. Brandy Alexander smells very much like a glass of delicious brandy, and it is definitely one of my favorite smelling snuses. 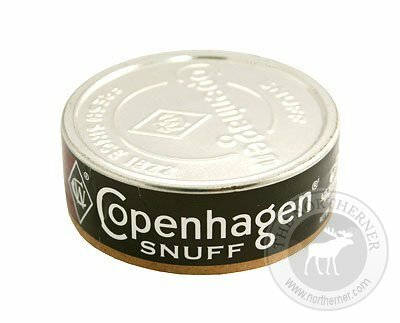 Its also interesting to note that my friends who smelled the can also really enjoyed the aroma, with some remarking that it was the best smelling snus they’ve seen! Upon portion a portion into my mouth, I detected a rich and creamy brandy taste consistent with the aroma, and I noticed a very slight tobacco flavor. The brandy flavor was extraordinarily savory, and kept going strong up to the thirty minute mark. After this point, the brandy flavor began to become weaker and gave way to a mellow tobacco taste. Unlike most varieties of snus I’ve tried, Brandy Alexander is not very salty, and is instead a little sweet. I liked the sweet flavor, and I didn’t find that the snus dripped very much while in my mouth. Something which I noticed was that Brandy Alexander is quite moist, but not overly so. This high moisture level sped up the nicotine absorption process, resulting in a fast yet long lasting buzz. Although it isn’t as strong as some snus brands out there, the loose format allowed me to create a portion of approximately 1.5 grams, which suited my preferences. The grind of Brandy Alexander is extremely fine, and the loose variety is very easy to form portions with. However, I prefer to use my IceTool rather than handbake portions, as I find it tends to make a really consistent portion. Overall, Nordströmmen Brandy Alexander is a solid snus for Brandy fans, or even for those looking to add a new and unique flavor to their snus rotation. I find that Brandy Alexander works extremely well as an after-dessert snus, or while sipping on some fine brandy. I’m very happy that V2 brought Brandy Alexander back, and I feel that its a solid brand of snus which everyone should try at least once. 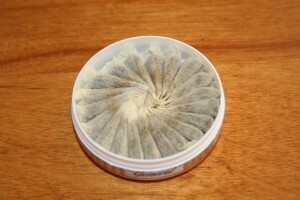 Another fine offering from V2 Tobacco, Offroad Wintergreen is a full sized snus which has a wintergreen flavor profile. I’m a big fan of V2’s offerings of low priced yet high quality snus, so I was eagerly anticipating getting to try Offroad Wintergreen. 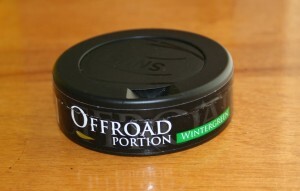 With 24 portions per can, Offroad Wintergreen is classified as a regular portion snus and contains 8mg of nicotine per portion of snus. When I initially opened my can of Offroad Wintergreen, I was greeted with an aroma which reminded me of blended tobacco combined a hint of wintergreen. Upon putting a portion into my mouth, I was surprised at how little wintergreen flavor was actually present compared to other brands. This flavor was also a little bit salty, and after about twenty-five minutes the salt flavor became a little too overpowering for my tastes. At the thirty-five minute mark, I had to take the snus out because the flavor had become too salty and bitter for my tastes. The portions were of average quality, and I soon discovered that I was able to keep a portion in for approximately thirty minutes before I felt the need to remove it. After the twenty five minute mark, the snus began to taste very salty, and not long after the slight wintergreen taste gave way to a quite unpleasant flavor which I can’t quite put my finger on. At this point, I also found that Offroad Wintergreen began to drip quite a bit, and I didn’t enjoy this sensation. 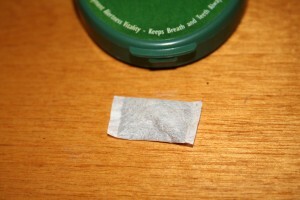 Overall, I felt that Offroad Wintergreen is a solid snus with a slight wintergreen flavor. Although I had no problems finishing my can, I don’t think I’ll be ordering any more, as once the wintergreen flavor dissapared I didn’t enjoy the bitter taste which took over. I hope that V2 alters the formula a little in order to incorporate more wintergreen and less salt. Despite these shortcomings, Offroad Wintergreen proves to be a great snus for individuals who are on a budget, as well as those who enjoy a subtle wintergreen flavor rather than a dominant one. 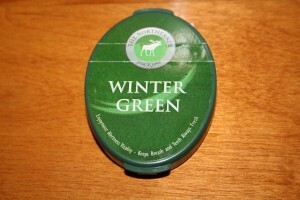 Northerner Wintergreen is another fine brand produced by the folks here at Northerner. I reviewed Northerner Citrus & Menthol in a previous blog post and thoroughly enjoyed it, so I figured that I’d review the Wintergreen variety as well. 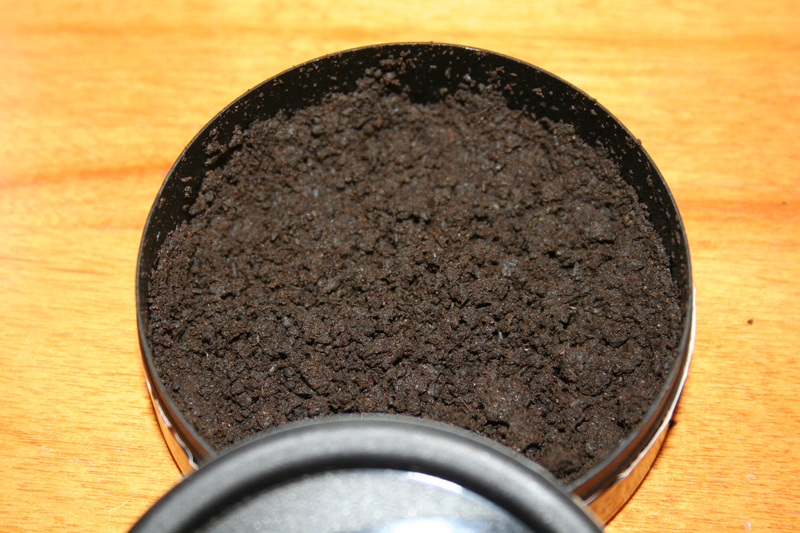 Each can of Wintergreen contains 24 portions of snus. The snus also contains a little bit of baking soda, which helps to whiten your teeth and keep your breath fresh as you snus! Northerner Wintergreen is classified as a dry portion snus, and I find it to be extremely dry even for dry portions. Upon opening my can, the portions felt very dry and had no detectable moisture inside them. 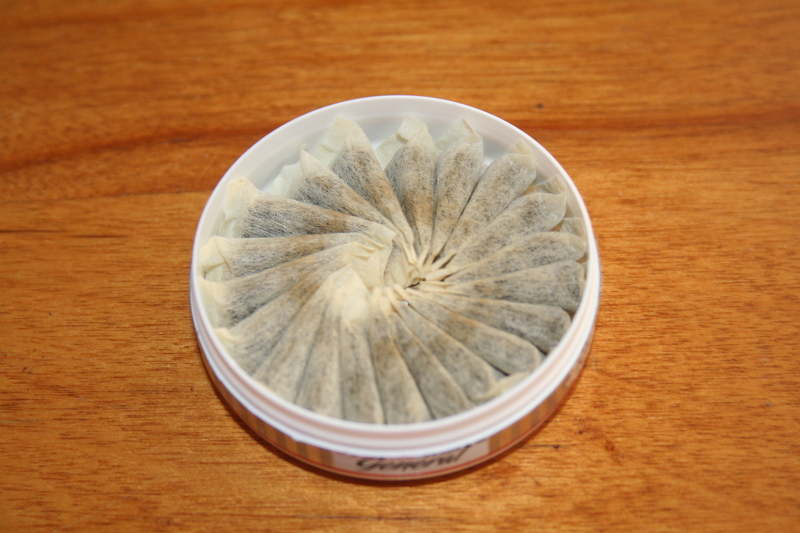 This dryness has the benefit of increasing the shelf life of the snus, and also lets you keep a portion in for much longer without getting any drip. I didn’t notice much of a smell with this snus, and once I put a portion in I noticed that it was hard to detect much of a flavor at all. After about ten minutes, I began to notice a slight hint of wintergreen, but it was very mild. There was also a salty flavor present, and I found it to be quite pleasant. After twenty five minutes, the wintergreen flavor completely disappeared, and I was left with the salty taste. During the time I had a portion in (about an hour and fifteen minutes), I didn’t detect any tobacco flavor whatsoever. One thing I really enjoyed was how there was little sensation of sweetness present. I find that a number of snus manufacturers tend to add too strong of a sweet flavor in their mint and wintergreen offerings, but this wasn’t the case with Northerner Wintergreen. portion material used to make Offroad Eucalyptus Mini. I was able to keep these portions in for over an hour without too much drip, which I really enjoyed. 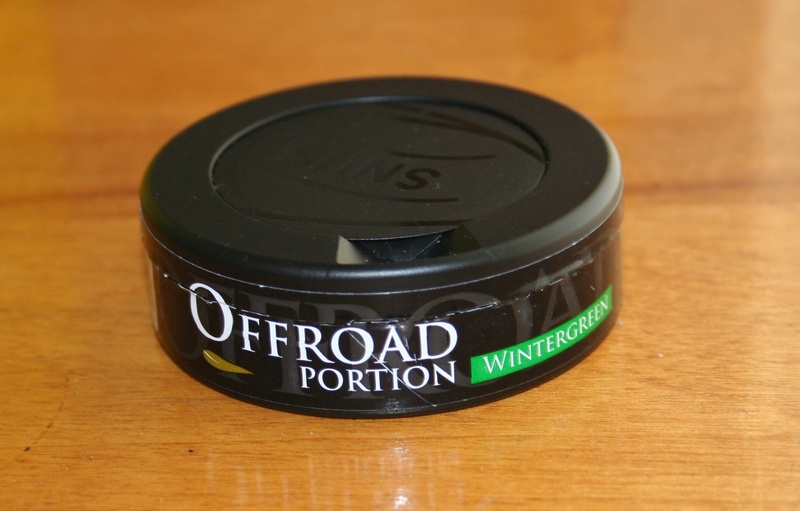 Each can of Northerner Wintergreen has 6 grams of snus containing 6mg of nicotine, placing it in between mini snus (at 2-3mg of nicotine) and standard snus (8-9mg of nicotine). For their size, I really liked the strength of this snus, and I had a slight buzz within ten minutes of putting a portion in. If you’re looking for a compact snus with a good amount of nicotine, then I highly recommend giving Northerner Wintergreen a try. The flavor is quite weak, but I find that as a result it pairs nicely with certain beverages. I found that Wintergreen paired well with some creme de menthe on ice as well as standard gingerale. 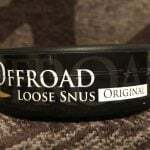 Northerner’s own line of snus has been shaping up to contain a great selection of snus for every taste, and I love using it when I need a little bit of a kick while keeping discreet. However, the lower amount of nicotine present may leave some people feeling unsatisfied.